Gellert Hill is the place where the Budapest Citadel is located. The Hapsburg dynasty decided to build the fortress on top of the hill precisely due to the strategic and geographical advantage it represented, featuring the highest altitude in Budapest (235 meters). Back then, it served as a military lookout (a function it kept even during World War Two), but now it offers the most stunning panoramic views of Budapest. Gellert Hill (in Hungarian, Gellerthegy) is located on the very bank of the Danube, in Buda, stretching on two districts (district I and district IX). The Elisabeth Bridge and the Liberty Bridge are equally close located to Gellert Hill, which is why tourists accommodated in Pest can resort to either one of them in order to get to Gellerthegy. The hill bears the name of bishop Gellert (Gerard) who helped King Saint Stephen to Christianize the Hungarian population, but it was martyred by those who resisted. In honoring his contribution to the process of Christianization, a statue rendering the bishop was placed on top of an artificially created waterfall on one of the slopes of the hill (the one facing the Elisabeth Bridge). 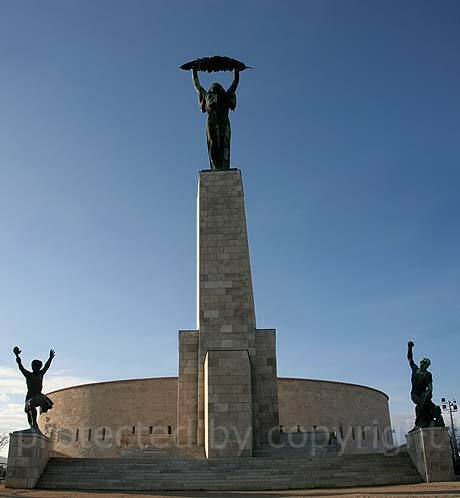 However, the hill as such is overlooked by the Statue of Liberty (Szabadsag Szobor), originally designed by Kisfaludy Strobol Zsigmond and built in 1947 as a symbol of the liberation the Communists brought to the Hungarian people. Given its origin, the statue was removed and sheltered, along with all the other Communist sculptures in Budapest, at the Statue Park (Memento Park). At present, the statue overlooks the hill from a 26 meters high pedestal, rendering a woman gloriously holding a palm leaf above her head, arms stretched upwards. Other notable attractions on Gellert Hill or at its base refer to the Gellert Bath (eastwards from the Statue of Liberty), to the Rudas Bath and to the Gellert Hill Cave. In all likelihood, the cave formed several hundreds of thousands of years ago, by the same erosion process which led to the formation of the Gellert Bath. In time, this natural cave served as refuge (and even residence for the poor) and field hospital (during World War Two), but at present it is more of a place of worship, sheltering a chapel and a monastery looked after by members of the Pauline order, established here since the 1920s (with a considerable interruption of about 5 decades during the Communist regime).